Easy, delicious and nutritious, this side dish can be made ahead of time and reheated. Discard tough outer cabbage leaves. Cut cabbage in half, then into quarters without cutting the core. It is easier to shred the cabbage when you have the core to hold on to. Heat the oil in a wok, add all of the cabbage and 2 tablespoons of hot water. Cover, stir from time to time, and sauté for about 3 minutes. The cabbage should be tender. 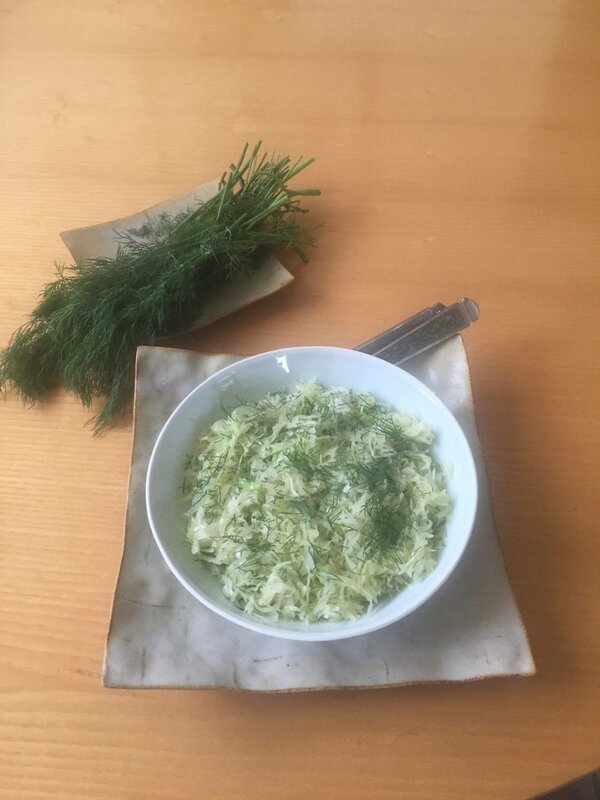 Season with salt and pepper and add the dill. I use a mandolin to shred the cabbage; it is much easier to handle than using a knife.